Th is is the signature cheese from Plymouth Artisan Cheese. It is a full-bodied mature cheese with extremely well developed flavors that has been aged to bring it out its full potential. It is a sharp cheese with notes of butter, fruit and nuts. John Coolidge, the father of Calvin Coolidge, the 30th President of the United States, opened the Plymouth Cheese Factory in 1890. Plymouth Cheese is an American heritage cheese with its own unique characteristics and a fine reputation. The Plymouth Cheese Factory in Plymouth, Vermont, is one of the oldest cheese operations in America. Plymouth Artisan Cheese is traditional granular curd cheese. The art of achieving the rich open bodied texture of granular curd cheese comes about through the skillful cutting and continuous stirring of the curds, both mechanically and manually. This process takes hours and is still utilized today to produce this authentic classic American cheese. The recipe for what became Plymouth Cheese arrived with the first European settlers to the New World and has been modified over time to become what it now used. Although granular curd cheeses were widely made throughout the colonies this practice slowly died out over time and was replaced by the factory process. When John Coolidge sited his cheese factory in Plymouth, Vermont, Plymouth Cheese as we know it today was born. The Plymouth Cheese Factory operated until 1934 when the factory was closed due to a milk shortage caused by the Great Depression. Plymouth Cheese disappeared from the American landscape until 1962 when John Coolidge, the sole surviving child of President Calvin Coolidge, decided to return to Vermont and revive the Plymouth Cheese Factory. From 1962-1998 John Coolidge re-introduced Plymouth Cheese, and at the age of 92 sold the cheese factory to the State of Vermont where it now sits at the center of the President Calvin Coolidge State Historic Site. In July of 2009, Jesse Werner took over the Plymouth Cheese Factory and started making Plymouth Cheese to the same exacting standards that such a pedigreed American heritage cheese demands. Jesse is an artisanal cheesemaker and all of his cheeses are produced in small batches and aged on site. All of the cheeses are handmade from raw cow's milk received from a single local herd that is continually monitored for quality. All of the milk for Plymouth Cheese comes from a farm that engages in the best dairy practices and humane treatment of their livestock. Only the finest and freshest milk goes into the cheeses. Granular curd cheese is very rare and Plymouth Artisan Cheese may be the only cheese factory that still produces this distinctive American heritage cheese. The sharp flavor and creamy firm texture of Original Plymouth make it a great cooking cheese that holds its own when mingled with other flavors. Here are a few great ideas that incorporate the classic taste of Original Plymouth into a menu that would work well for a truly delicious Vermont Thanksgiving. All you need to add is the turkey. Put the flour, baking powder, salt, and cayenne in a food processor. Process briefly to blend. Dump in the butter and pulse until the butter is in pea-size pieces. Add the cheeses, pulse briefly, then add the egg and pulse until the mixture just starts to come together. Dump out on a lightly floured work surface. Sprinkle the nuts onto the pile of dough. Knead by lightly smearing the ingredients together by pushing them away from you with the heel of your hand. When the nuts are mixed in, and using a bit more flour if necessary to keep it from sticking, shape the dough into a 1 ½ inch diameter log, wrap in plastic, and chill for 2 hours to let the whole thing firm up. Pre-heat the oven to 400°F. Slice thin ¼ inch rounds from the log and place them on a parchment lined cookie sheet. Brush the tops lightly with the glaze and sprinkle with sea salt. Bake in the hot oven until golden brown and thoroughly cooked inside, about 14 minutes. To test, break one in half and look; if the center is still light and doughy, bake for a few more minutes. Cool on a rack and store only when completely cool. In heavy medium saucepan over medium heat, melt butter then add onion and leek. Sauté until tender, then sprinkle in flour and stir well to incorporate. Cook for 3-4 minutes, stirring constantly, then slowly whisk in broth and wine until smooth. Add carrots and then simmer 15-20 minutes, until soup is thick and creamy and carrots are tender. Remove from heat and stir in cheddar, Worcestershire, cayenne, and salt. Stir in cream. Return to a low heat and stir constantly to make sure the soup does not boil but just gets heated through. Serve with a sprinkle of the fresh herbs on top. Toss the squash with the oil and salt and roast on a rimmed baking sheet for about 20 minutes, until tender. Set aside. Whisk eggs in a large bowl and add the half and half, mustard and salt. Add the pieces of bread and stir to mix. Let the bread soak in the egg for 30 minutes, stirring halfway through. While the bread is soaking, heat 2 tablespoon of oil in a large sauté pan over medium high heat. Sauté the shallots until soft then add the kale and cover the pan. Cook for 5 to 7 minutes, stirring occasionally, until the kale is wilted. Turn off the heat. Reduce the oven to 350˚ F. Butter a 13×9 inch baking pan. Using a slotted spoon, transfer about half the soaked bread mixture to the pan spreading it evenly. Spoon half the kale and half the squash over the bread. Sprinkle with half the cheese and repeat with the rest of the bread, vegetables and cheese. Pour whatever egg mixture is left over the cheese. Cover the pan loosely with foil and bake for 20 minutes, Remove the foil and bake for another 20 minutes, until the custard is set and the top is golden brown. Remove from oven and cool for 10 minutes before serving. Place flour, sugar, salt in a food processor and pulse for 5 seconds. Add butter and pulse until butter is pea size. Do not over-process! Add cheese and pulse 4 times. Dump the whole mess into a large cold bowl and sprinkle the 5 tablespoons of ice water on top. Using a fork, toss until the mixture forms large clumps. Add more ice water by tablespoon if the mixture is too dry. Gather the dough into a ball and divide in half. Shape each half into a disk, wrap in plastic and refrigerate for at least an hour. Mix sugar and cornstarch and toss with apples, lemon juice and salt until evenly coated. Roll out 1 disk of pie dough to about 13 inches. Transfer dough to 9 inch glass deep dish pie plate, letting the excess hang over the rim. Empty the apple filling into the pie plate and brush the dough overhang with water. Spread the diced butter evenly on top of the apples. Roll out remaining dough and place on top of the filling. Press the dough together at the pie plate rim to seal. Trim the overhang to ½ inch, fold under and crimp. Cut a few small slits in the top of the crust. Bake until golden brown, about 30 minutes. Lower the heat to 375 and cover the edge of the crust with a cut out circle of tin foil to protect it from burning. Bake until the filling bubbles thickly out of the slits, another 30 minutes or so. Cool pie on rack for at least 1 hour. Slice and serve. 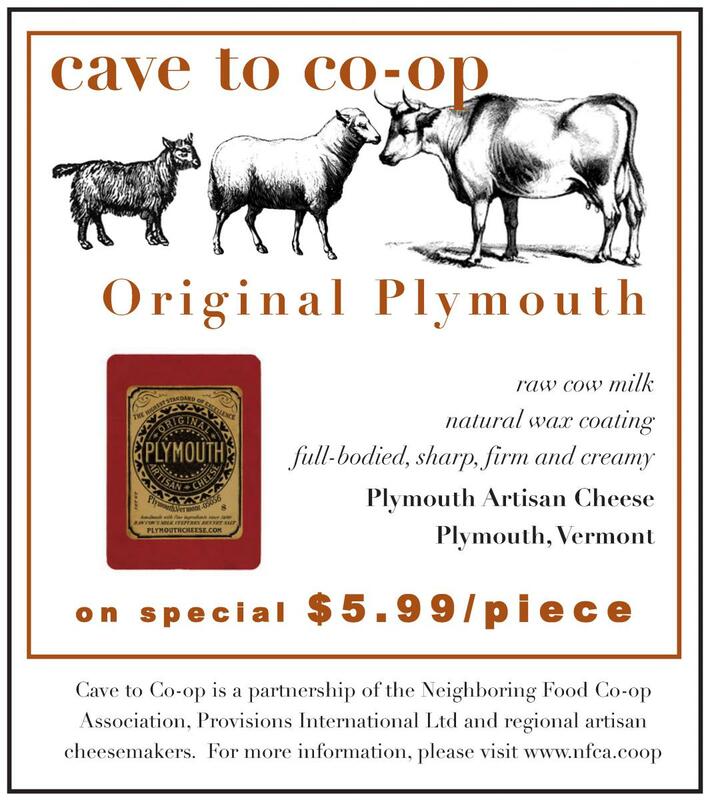 Cave to Co-op is a partnership between Provision International and the Neighboring Food Co-op Association (NFCA) to support local, artisanal cheese producers in our region and make their products more easily available to co-op shoppers. The NFCA is a network of more than 20 food co-ops in our region — including yours — that are working together to advance their vision of a thriving regional economy, rooted in a healthy, just and sustainable food system and a vibrant community of co-operative enterprise. For more information, please visit www.nfca.coop.